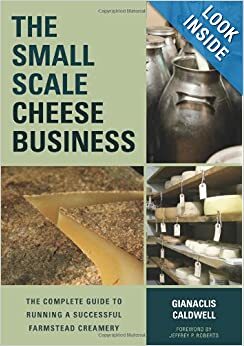 I have just published on Amazon an ebook (5.99) for those just getting started making cheese. It is a different approach than any other beginning book available. The recipes are lessons, each one builds organically on the previous and adds a layer of skills and knowledge. I hope you will give the book a try or share its availability with anyone who might be interested! Remember, you don’t need a Kindle device, you can download a FREE Kindle for PC to your computer and then read in color. We’re going to start our journey by making some really fun, tasty, super simple cheeses. The first lessons in cheese and milk chemistry are also the first dose of the magic of making cheese. In all of the lessons in this chapter, we’ll be using heat and added acid to force the solids in the milk—the protein, fat, and minerals—to separate from the watery portion. At the unseen level, milk behaves very differently when it is hot compared to when it is cold. It also reacts radically to having something tangy and acidic added to it—it curdles. The hotter the milk, the less acid is needed to produce this amazing chemical reaction, but—and here’s your first important milk chemistry lesson—the hotter the milk when the acid is added, the more chewy the end product will be. This quick, super easy method includes just three basic steps. It produces a family of versatile fresh dairy products, including such classics as Italian ricotta and Indian paneer. 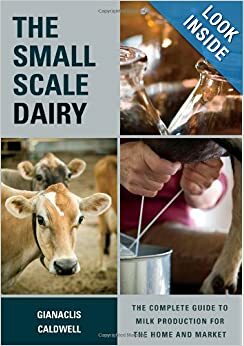 Most recipes in this chapter will yield 1.5–2 pounds of cheese per gallon of milk (0.7–0.9 kg per 4L) depending on whether the curd is pressed or not. 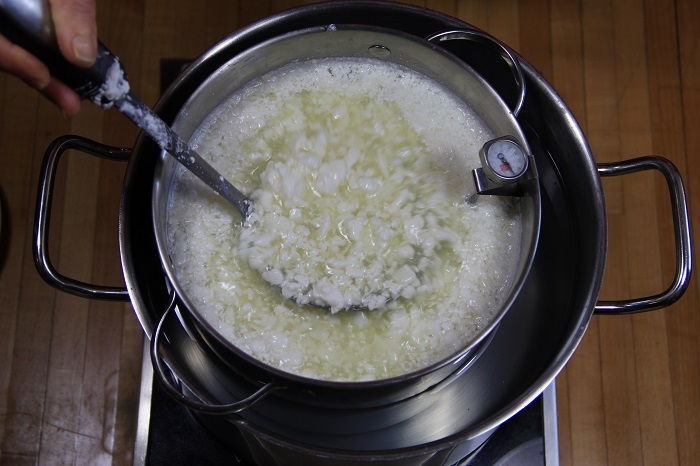 This method uses high heat ranging from 175ºF to 220ºF (79ºC to 100ºC) to form curds in the milk. Heat does several things to milk (including destroying bacteria and enzymes), and the changes it causes depend on both the temperature and how long the milk remains at that temperature. For the purpose of making high heat and acid cheeses, the heat does two things: First, it makes some of the proteins in milk stick together. This makes these cheese types higher in protein and clumpier in texture. Second, the heat helps the acid to coagulate the curd. The higher the heat, the less acid is needed. FAQ: Warming MilkQ: After milking do I have to chill the milk before I make cheese?A: No. One of the best things you can do if you have access to milk straight out of the animal is to start the cheesemaking or milk fermentation process right away. Don’t wait more than an hour, though, as other bacteria in the raw milk will start to grow and possibly cause quality or health problems in the product. Q: How often should I stir the milk while it is warming? A: That depends on how quickly you are heating it. If it the pot is sitting directly on the hot burner, the milk should be stirred constantly. But, if it is sitting in a sink filled with hot water, you should stir it every few minutes. Q: If the milk burns a bit, can I still use it to make cheese? A: In theory, yes, but the flavor will be tainted. It is better to send it to the compost pile and spend the rest of the day reading a good book. Q: If the milk gets too warm, what do I do? A: If the milk gets a little warmer than the goal temperature, you can set the pot in a sink of cool water and stir it until it cools down to the desired temperature. But, if it gets really hot, say about 170°F (77°C), consider making it into yogurt or ricotta. Once the milk has reached the goal temperature, acid is added to make the curds separate from the whey. Slowly drizzle the acid into the milk while stirring gently. As soon as the acid is added, all of the proteins in the milk will begin to clump and form curds. (The first time you see this, it is truly magical.) Continue stirring very gently to avoid breaking the curds up into little pieces. Once the curds and whey have separated in the pot, the curds are drained. 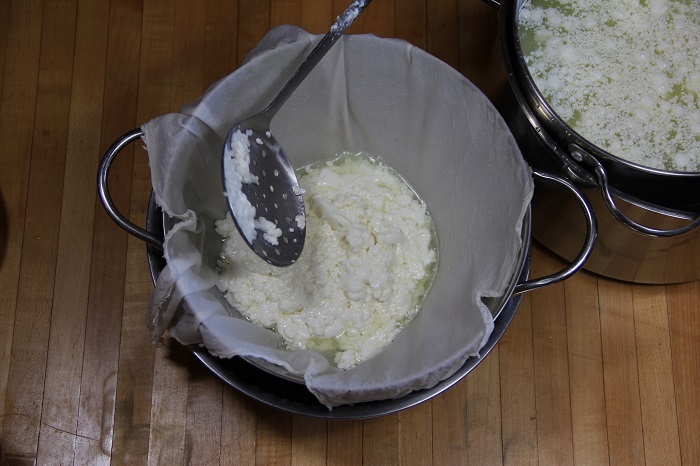 This process might be as simple as scooping and pouring the steaming curds into a cheesecloth-lined colander, or you might follow this step with gentle pressing to form a solid cheese. Remember the whey from high-heat cheeses is extremely hot so place the colander over another pot or in the sink to keep from getting splattered. You can use quick and simple cheeses right away, store in the refrigerator for about a week, or in the freezer for up to many months. Before storing, cover or wrap the cheese tightly in to keep out unwanted flavors and yeasts and molds. These cheeses don’t have a long shelf life and are prone to spoilage because they are so moist. The cheeses in this chapter will create whey that contains some milk sugar, acid, a bit of fat, and some protein (but not much). There isn’t much nutrition in it, especially compared to the whey we’ll collect in chapters 7 and 8, so it isn’t good for as many uses. You can use it to water acid-loving plants (such as evergreen trees, azaleas, and most berries) or pour it on compost or down the drain. There is a whole family of fresh cheeses made with milk, whey, or a combination of whey and milk to which acid is added. Of these, North Americans may be most familiar with ricotta, but it comes in many other guises around the world including brocciu (BRO-shu) from Corsica (made from sheep’s whey and milk) and anari from Cyprus (made from goat’s or sheep’s whey and milk). While the fresh versions are better known, the cheeses can be dried and heavily salted to create tangy, pungent grating cheeses. Greek mizithra (made from goat’s or sheep’s whey and milk) and Italian ricotta salata are two well-known examples, but gauze bags of traditional anari can also be seen hanging in of the windows of Cypriot cheesemakers. This is your first lesson in cheese anthropology; you will learn as we work together that pretty much every cheese has a doppelganger or two out there. So without further ado, let’s make our first cheese! Heat Milk: Pour the milk into the pot, and place the pot over medium-high heat. Heat the milk, stirring constantly and scraping the bottom of the pot with the spatula, until the temperature reaches 180–185ºF (82–85ºC). If the milk starts sticking to the bottom of the pot, lower the heat and continue stirring. Add Acid: Remove the pot from the heat. Slowly drizzle the vinegar or lemon juice into the milk while stirring gently; the curds will begin to separate immediately. Continue stirring gently until the whey is a translucent yellow, about one minute. Watch closely and stop stirring as soon as the whey turns clear. Set: Let the curds set in the pot, uncovered, for 10 minutes; this gives them time to collect and cool a bit. 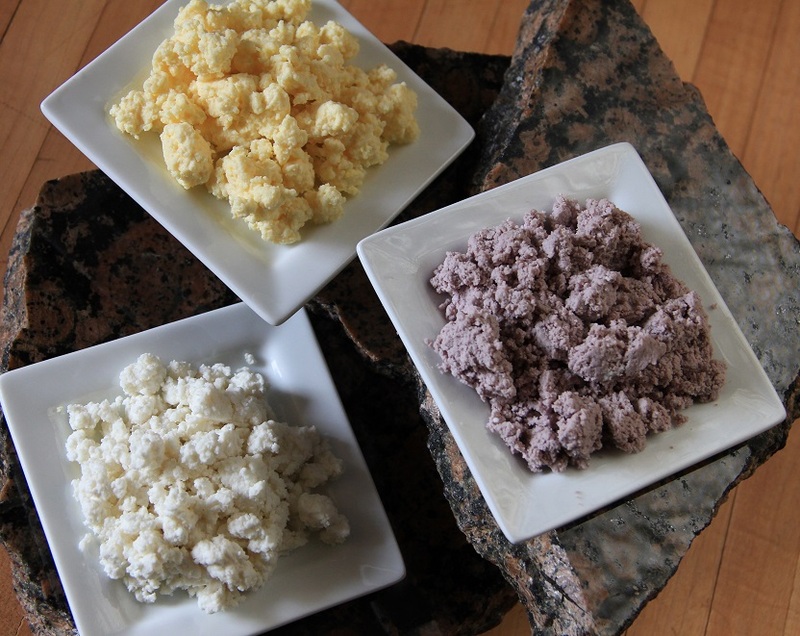 Store and Use: Use the ricotta right away, or tightly cover and store it in the refrigerator for up to 5 days. Curd is too small or doesn’t form: Try stirring more slowly when adding the acid, adding more acid, or increasing the heat. Cheese is too sour: Try adding less acid the next time and adding it more slowly so that you can see if the curd separates. If it is just too sour to use, try adding a pinch of baking soda to the final product to neutralize the acid. Wasn’t that easy? Have you tasted it yet? The ricotta will be simple, a bit tangy, and have a pleasant cooked milk taste. Milk ricotta (we’ll learn how to make whey ricotta later) can be made from any type of milk—skim from the grocery store, rich, creamy sheep’s milk straight from the pail, even camel milk, should you have one of those lovely beasts around—as long as it’s fresh and of high quality. But, the amount of cream or butterfat in the milk you select will have a huge influence on the texture of the cheese. For ricotta a certain amount of fat will help make it—brace yourself—creamy, but if you try to make it from something like half-and-half or cream, you will create a very different product. Speaking of cream, let’s move on to our next lesson!